Recently I saw an interview on a late night show here in Ethiopia. What intrigued me was not the usually humorous nature of the show, rather one of its guests. Bethlehem Alemu is the dynamic founder and owner of SoleRebels, a game-changing shoe company in the heart of Addis Ababa, the ancient capital of Ethiopia. Due to her success and ingenuity, “Fortune” magazine has placed her on top of its cover. She has also been featured by CNN and the BCC, in addition Forbes has named her one of Africa’s Most Successful Women. Amazingly, the source of Bethelehem’s success is not gold or oil rather it is her imagination and creativity to turn old tires into designer shoes and sell them all over the world. For most of us an old tire is nothing of value, something to be thrown away. But for this creative lady and her company it is a treasure; a multi-million dollar treasure that has changed the lives of many. Bethelehem’s success is a classic example of innovation at its best. It can be an example for many Ethiopians and it is an important raw model in a country where resources are scarce and joblessness looms. This can also be an example for BCI’s push toward self-sustainability for its families. That is why, in a clear understanding of empowering families, some BCI missionaries have recently held an event that has illustrated what can be done with simple resources such as pieces of paper. The events main theme was to empower BCI women in income generating schemes and was dubbed as the first of its kind to ever be held by BCI. The event was organized by Blessing the Children – Ethiopia and a team of missionaries from Portland, Oregon. 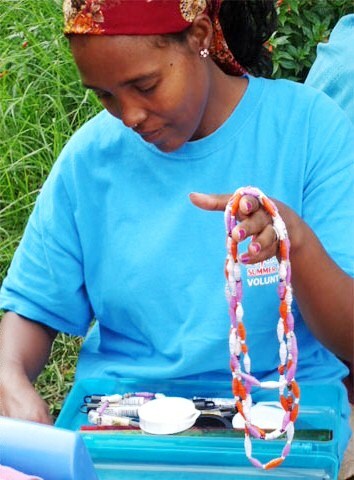 During the event the missionaries illustrated to the attendees how to make necklaces and bracelets from pieces of paper, string, and glue. The attendees received the training enthusiastically and saw it as a positive start toward self-sustainability. The event left a feeling of possibility and encouragement, despite different obstacles. 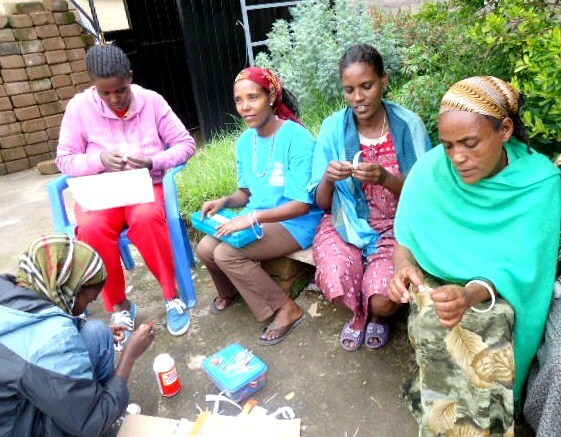 The women have learned that with some imagination they can take the little resource that they have in their surroundings and turn them into sources of income. 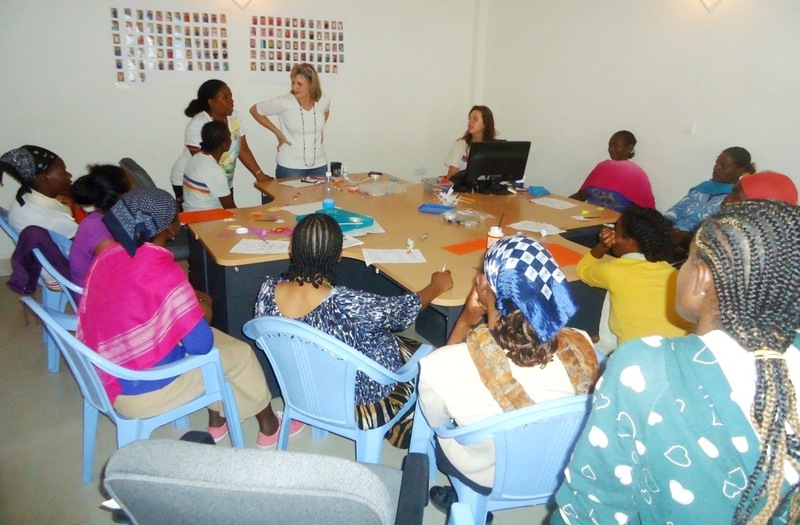 Because of the training the women have also begun a regular meeting to share ideas and develop their creativity. The ladies working on their beads. The training has also proved that our mothers are willing to roll up their sleeves and fight for self-sustainability. It is also a lesson that, with a little help, self-sustainability is achievable. Therefore we would like to express our deepest gratitude for Team Portland; even though they have left Ethiopia their positive impact lives on.